Djuma Game Reserve is nestled in the Sabi Sands, deep in the heart of the Kruger National Park. You will be taken on incredible adventures, and get up close and personal with the big 5. Ever wanted to meet real life Simba in the wild? While now you can! At Djuma Private Game Reserve you will most certainly experience the African safari at its best. This world renowned Private Reserve boasts 7 000 hectares of unbeatable game viewing that will give you an unforgettable experience. Djuma Private Game Reserve boasts comfortable accommodation in 2 stylish lodges, right in the heart of the bush. You will be impressed here, as it offers some of the best game viewing in Africa and their expert guides will ensure that you have a memorable safari. So what does a typical day look like? Most guests will arrive at the Reserve after lunch and will head out on an evening game drive before dinner. 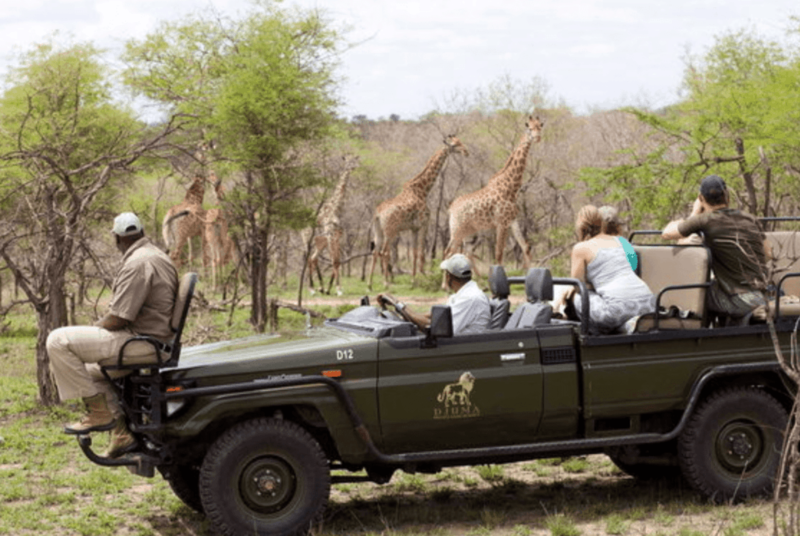 This is a great chance to see the animals and sip on refreshing sundowners.The next morning, a typical day on safari in the Djuma Game Reserve starts. A guide will wake you up for the early morning for a game drive. This is one of the best times for spotting the animals, as this is when they are most active and your chances of seeing them are better. It usually takes around 3 hours. The Djuma Game Reserve is known for its excellent leopard and elephant sightings. So what are you waiting for? Take the trip of a lifetime.